"Product Roundup" of the latest Combine Header offerings from some of the industry's leading suppliers. Calmer Hardened Beveled Stripper Plates are now available for JD 600 series, CASE-IH 2200/2400 series, and NH 96c, 98c, and 996 corn heads. Increase your corn yield in any type of corn--standing or lying--with Kaler Farms Corn Stalk Guide. 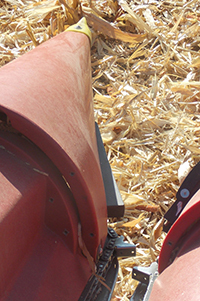 The Corn Stalk Guide is an after-market attachment for most poly snouts and some metal snouts. 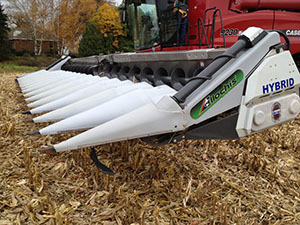 The Corn Stalk Guide will move the stalk past the idler chain and gear to lessen the jarring and shaking of the stalk, thereby getting your corn into the combine hopper. The Corn Stalk Guide also helps protect the soft poly as it is made from UHMW plastic. We are a USA-made product. Flip Reel Kit Manufactured from HCC Inc. 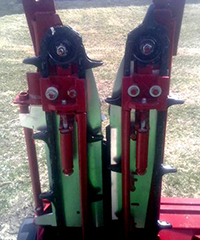 Designed as a replacement system to the standard reel, the Flip Reel Kit increases combine efficiency with its tine flipping action to feed heavy crops into the header. Available through HCC­affiliated distributors and dealers. Click here for more information or call 815-539-9371. The aluminum framed corn head from Tango4 is the lightest head on the market. With row spacings of 30,22,20,18 and 15 inch and rows from 4 to 24, we have the head for you. This head will mount on any combine as well as pickers and forage harvesters. 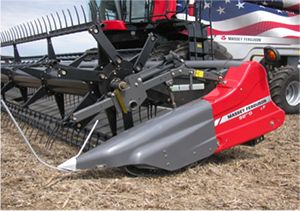 Reduce compaction on your fields while taking the stress off of your combine. Better balanced for greater stability and safety. 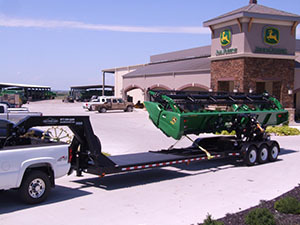 The Retriever® Self Loading Trailer features a self-contained hydraulic lift system that allows one truck and operator to pick up and transport combine heads (up to 45’ and beyond) as well as 3-point mounted equipment (up to 54’) without the need for a combine, forklift or tractor to assist. The Retriever SLT increases the efficiency of farm equipment dealers by reducing manpower and equipment. The operator simply backs up to the head, lifts the load with the head adapter, rotates the load lengthwise, secures load and drives away. Unloading is just as easy, a one man operation. The Retriever SLT works with draper, corn and grain heads and allows servicing of the heads while on the trailer.